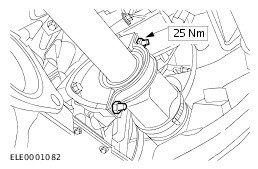 Slacken the suspension strut nuts by five turns on both sides (left-hand side shown). 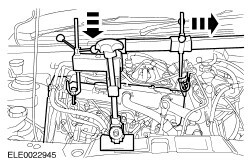 Detach the lower suspension arm from the spindle carrier on both sides (left-hand side shown). 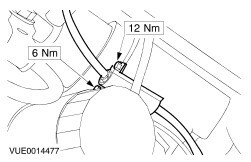 NOTICE: The inner joint must not be bent at more than 18 degrees. Detach the left-hand front drive halfshaft. Separate the clamping strap and slide back the boot. Pull out the front drive halfshaft from the tripode housing. Remove the grease from inside the joint. Secure the front drive halfshaft. 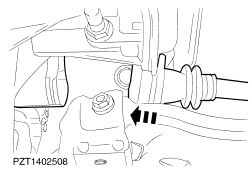 Remove the right-hand front drive halfshaft with intermediate shaft. 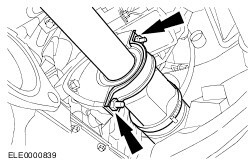 Pull the intermediate shaft from the transaxle. Discard the nuts and retaining bracket. 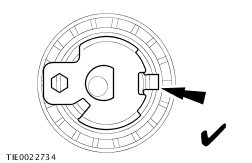 Seal the transaxle opening with auxiliary plugs. Detach the generator intermediate shaft. 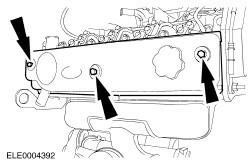 Remove the intermediate shaft bearing retaining bolts. 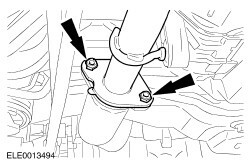 Remove the vibration damper retaining bolts. Remove the blanking plug and insert the special tool. Carefully turn the crankshaft until it touches the special tool. 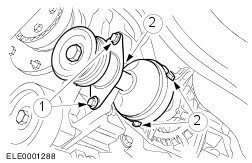 NOTE: Make sure that the engine does not rotate during installation of the special tool. 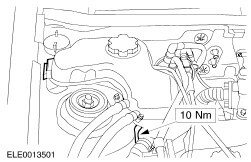 NOTE: Make sure that the engine is in the TDC position before the special tool is engaged. NOTE: Make sure that the special tool is engaged correctly. 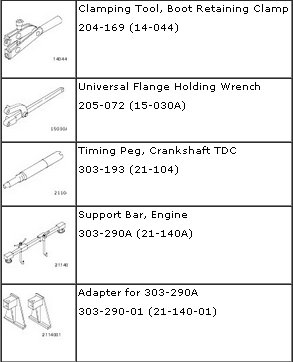 Install the special tool and lock the engine. Secure the shift mechanism, using cable ties. NOTICE: If the flexible pipe is bent too sharply, damage may be caused which can lead to failure of the component. Protect the flexible pipe with a support sleeve or suitable splints. 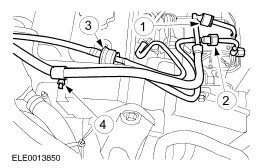 Detach the exhaust from the flexible pipe. 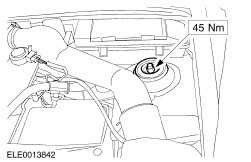 Disconnect the air conditioning (A/C) compressor electrical connector and detach it from the A/C compressor. Detach the A/C compressor (four bolts) and secure it to one side. 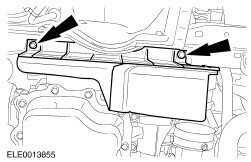 Remove the engine roll restrictor. Detach the accessory drive belt cover. 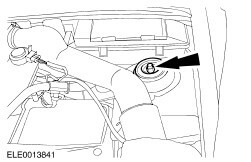 Detach the coolant expansion tank and position it to one side. Remove the engine front mount. Remove the engine rear mount. NOTE: Do not stress the cables and hoses. 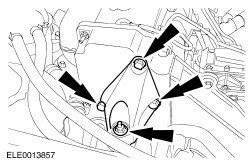 Using the special tool, lift the engine front and lower the engine rear. 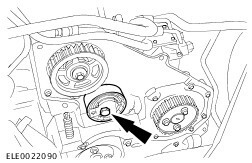 Slacken the accessory drive belt and remove it. 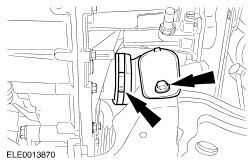 Remove the timing belt lower cover (engine shown removed for clarity). Detach the engine bracket (engine shown removed for clarity). Insert the special tool into the camshaft groove. 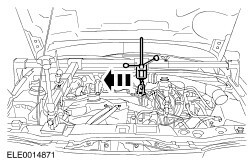 Slacken the timing belt (engine shown removed for clarity). 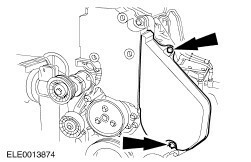 Remove and discard the timing belt tensioner. Remove and discard the timing belt. 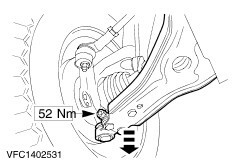 Using the special tool, loosen the camshaft pulley retaining bolt by five turns. 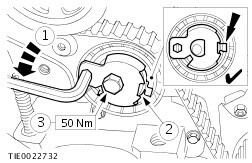 Using the special tool, release the camshaft pulley from the taper. 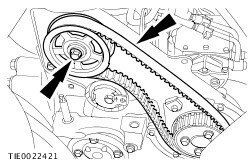 NOTE: Use only latest level timing belts. 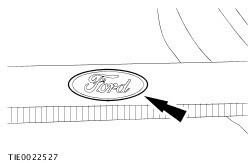 These are identified by a laser etched Ford logo. Check the new timing belt. 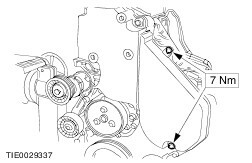 Install a new, automatic timing belt tensioner. 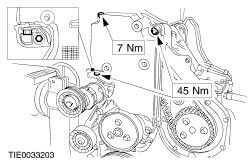 Check the automatic timing belt tensioner. 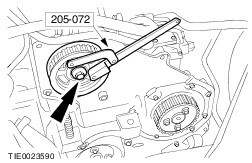 Make sure that the tensioner pointer rotates clockwise freely. 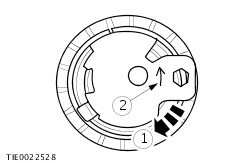 Arrow denotes counterclockwise rotation of tensioner. 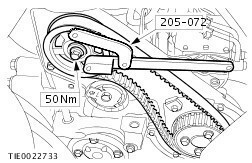 NOTE: Move timing belt tensioner adjustment arm to 3 o'clock position. 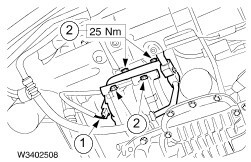 Install the timing belt tensioner and tighten the bolt finger tight. Never install a used timing belt. 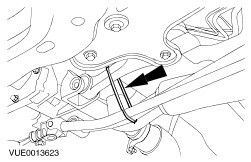 Install the timing belt with the direction arrows in the direction of engine rotation. 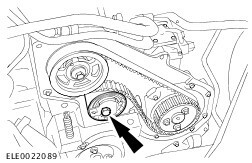 Only install the timing belt after the engine has cooled to workshop temperature. NOTE: Install a new timing belt. 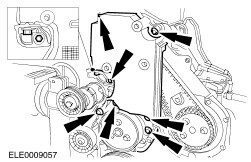 NOTE: The camshaft pulley must be able to turn freely on the camshaft taper. 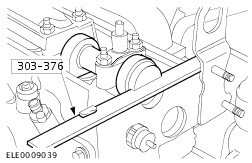 Tighten the camshaft pulley bolt finger tight and then loosen by 1/2 a turn. NOTE: Using an allen key, maintain tension until tensioner bolt is tightened. 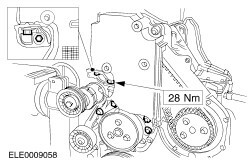 Turn the timing belt tensioner adjustment arm counter-clockwise to tension the timing belt slightly. The pointer must be positioned between the sides of the window. 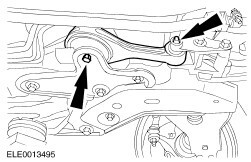 Tighten the timing belt tensioner retaining bolt. Using the special tool, tighten the camshaft pulley retaining bolt. 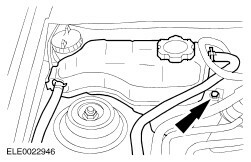 NOTE: Only turn the engine in the normal direction of rotation. 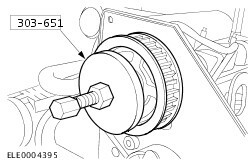 NOTE: Using paint or typing correction fluid, mark the crankshaft pulley to show TDC. Turn the engine six revolutions. Turn the engine to TDC. Turn the engine slowly until the crankshaft stops. 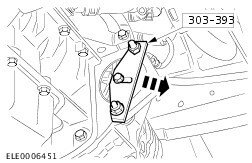 Make sure that the engine does not rotate during installation of the special tool. 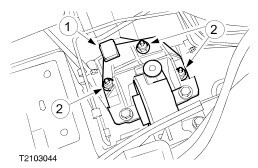 Make sure engine is at the TDC position before locking the special tool. 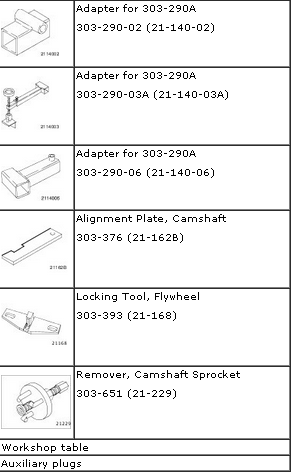 Make sure that the special tool engages correctly. Using the special tool, lock the engine. 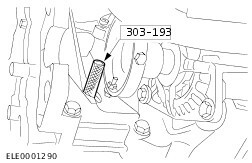 NOTE: The auto tensioner pointer may move slightly upwards in the window. 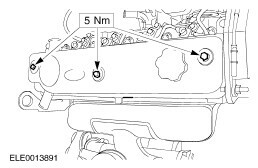 Check that the autotensioner pointer is positioned in between the sides of the window. 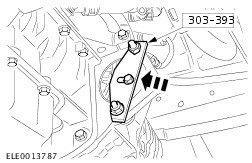 If the pointer is in the window, go to following step. If the pointer is not in the window, repeat the procedure. If the special tool cannot be installed, repeat the procedure. 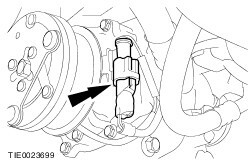 NOTE: Check the valve cover gasket and install a new if necessary. NOTE: Position the bolts in the bracket before installing the bracket. Install the engine bracket lower retaining bolts (shown on removed engine for clarity). 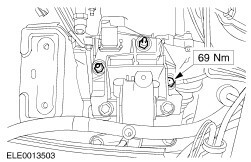 Install the engine bracket upper retaining bolts (shown on removed engine for clarity). 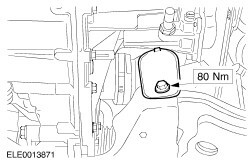 Install the timing belt lower cover (shown on removed engine for clarity). Using the special tool, position the engine, so the engine mounts can be installed. NOTE: Do not fully tighten the nuts at this stage. Install the engine rear mount. Tighten the nuts finger tight. NOTE: Do not fully tighten the nuts and bolts at this stage. Install the engine front mount. 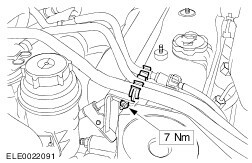 Install the engine roll restrictor. 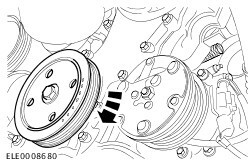 Attach the accessory drive belt cover. 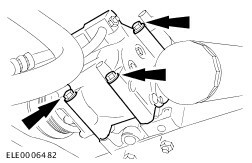 NOTICE: Always tighten the engine front mounting bracket before the engine rear mounting bracket so that the studs can be seated in the elongated holes of the engine rear mounting bracket. 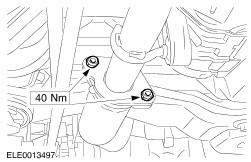 Tighten the bolts and nuts of the engine front mounting bracket. 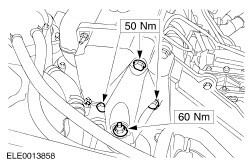 Tighten the nuts of the engine rear mount. 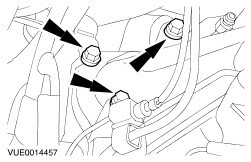 Connect the fuel return line. 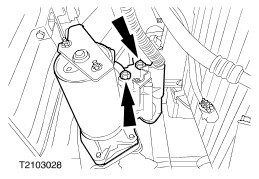 Connect the fuel supply line. Tighten the fuel pipe bracket retaining nut. Install the coolant expansion tank. Install the battery and the battery tray. Raise and support the vehicle. 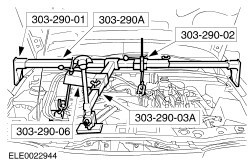 For additional information, refer to Section 100-02 Jacking and Lifting. NOTE: Install a new intermediate shaft bracket and nuts. 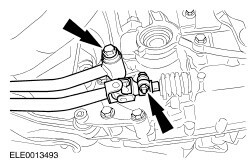 NOTE: Do not damage the oil seal when inserting the intermediate shaft. 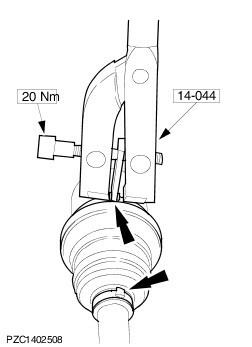 Install the right-hand intermediate halfshaft. 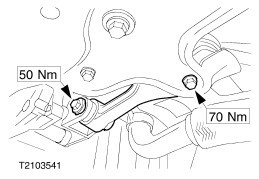 Guide the front left-hand and right-hand drive halfshafts into the tripode bells. Assemble the tripode joint with high-durability grease(fill quantity 125 g). 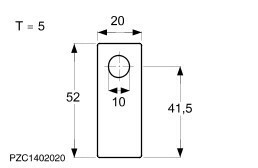 Make a clamp head for Special Tool 204-169. Position the tripode joint boot and secure it with clamping straps. Apply the special tool so that the clamp head is vertical to the clamping strap head. Tighten the clamping strap using the special tool. 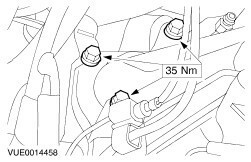 Install the flexible pipe on the exhaust pipe. 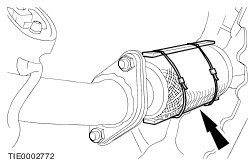 Detach the support sleeve from the flexible pipe. Attach the lower suspension arm to the spindle carrier on both sides (left-hand side shown). 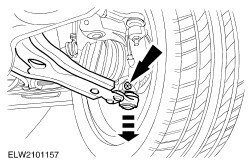 Tighten the suspension strut nuts on both sides (left-hand side shown). Reprogram the preset radio stations.